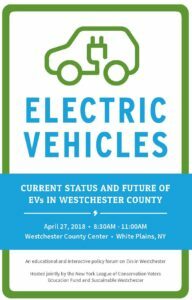 On April 27, 2018, together with our partners at Sustainable Westchester, we hosted a policy forum on electric vehicles. Bringing together state and local lawmakers, industry experts, community partners, and more, this policy forum looked at the current status of EVs and EV infrastructure in Westchester County. We discussed what local leaders can do to increase the use of EVs at the personal, municipal, and commercial levels. We also talked about what challenges we face in fleet adoption, and what policies or mechanisms we can leverage to increase EV use in the county. As a follow-up from the policy forum, we’ve put together a list of policy recommendations for how we can achieve our goals of transitioning municipal fleets, coordinating a plan for infrastructure, and getting an EV in every garage. Released jointly with Sustainable Westchester, these recommendations lay out specific ways for how we can increase the use of EVs in Westchester and achieve our goals. Check them out here. Help us achieve our goal of getting an EV in every garage by pledging to test drive an EV and see if it’s right for your family and by pledging to tell your decision-makers to electrify your local fleet. Contact list for municipal elected officials can be found here. Thank you to our generous supporter.